One of the questions that arose a few times during our Indianapolis trip was, “What exactly is a Hoosier?” Thanks to a handy pamphlet we picked up at the capitol building (I’m guessing visitors asked this a lot), we learned that there isn’t really a definition. Some sources cite it as a derivation of certain dialects (in Cumberland English, “hoozer” meant anything unusually large, such as a hill), generalizations of names (some suggest followers of preacher Harry Hoosier were the original “Hoosiers”), or conglomerations of phrases (poet James Whitcomb Riley in jest suggested that, after a brawl, someone picked a piece of a combatant off the ground and asked “Whose ear?”). Whatever the precise definition, it was a word we saw used proudly and often. 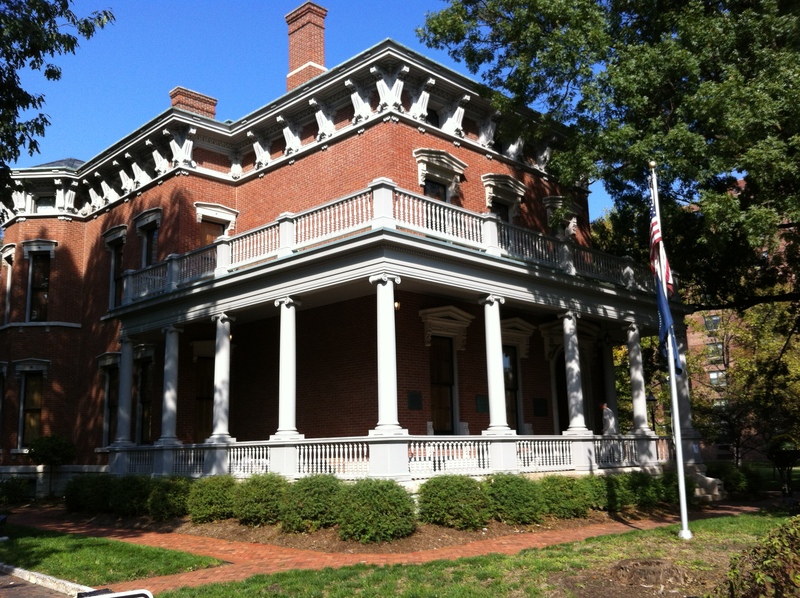 The home of President Benjamin Harrison, “the meat in the Grover Cleveland sandwich” (copyright Mike Neumann). With that in mind, we set off on day two to visit the home of first and only Hoosier president Benjamin Harrison and to finally answer the question: Benjamin Harrison — great president? or the greatest president? Turns out what our 23rd president is best known for is not anything he accomplished — the only landmark legislation he apparently passed was requiring all federal buildings to display the U.S. flag — but rather his placement in the presidential lineup. Harrison (grandson of shortest-serving ninth president, William Henry Harrison) is the “meat in the Grover Cleveland sandwich” as Neumann put it — he was the president to serve between Cleveland’s two nonconsecutive terms. The tour of the Harrison house was very interesting. Like I mentioned, we didn’t actually learn anything about his presidency, but it offered a glimpse into how rich people at the turn of the century lived. The Harrisons could both afford electricity in their house and servants to turn the lights on and off because they were afraid of getting electrocuted if they did it themselves. And in the great tradition of first-lady pet causes (move over, Michelle Obama’s food-pyramid-turned-plate), Mrs. Harrison took up the noble mission of designing the official set of White House state china (replicas were for sale in the gift shop). Most of the furniture and items in the house originally belonged to the family (including Benjamin’s collection of walking canes), so it was easy to imagine that the house looked very similar to what the former first family saw after their White House stay. Our museum day continued with a stop at the Indiana State Museum. I won’t spend too much time writing about the place since we breezed through the museum itself. Suffice it to say, and I’m stating this as a fan of museums in general, the Indiana State Museum was probably the most boring museum I’ve ever visited. The first floor was filled with the obligatory natural history museum rocks and fossil collection under the guise of “Indiana’s history began with the universe.” Please. 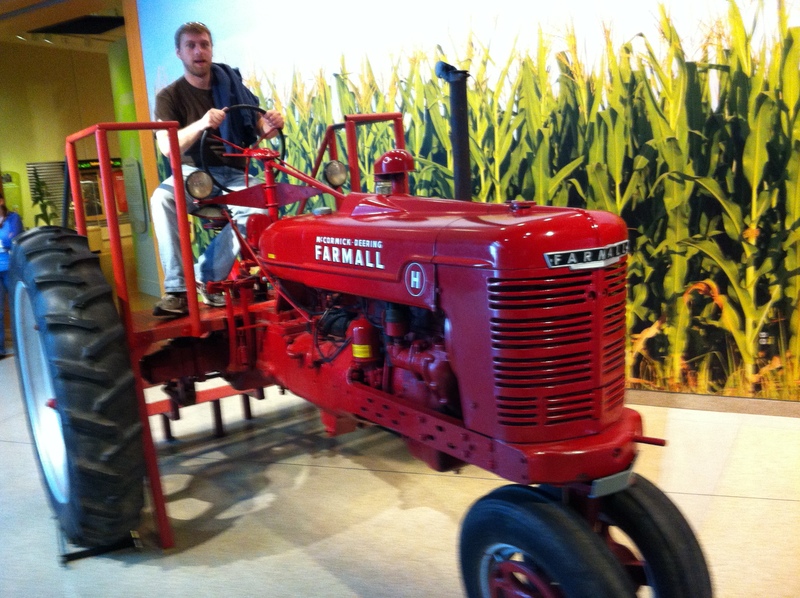 This was probably the most fun thing we did at the Indiana State Museum — sat on a tractor in front of fake corn. As we progressed upward in the building, the second story featured a few “cultural” artifacts belonging to various decades, including a car that was manufactured in Indiana. Half of the entire third story was devoted to an exhibit on corn. And if you thought there was no way a museum could turn something as dull as corn into a completely enthralling and engrossing exhibit, you were absolutely right. For a building that’s so modern looking and beautifully constructed, the Indiana State Museum’s exhibits did a great job of perpetuating the stereotype of how boring Indiana is. It made no mention of some of the characters in the state’s past like President Harrison or Oliver Morton, the revered governor during the Civil War whose statue sits outside the capitol building. Neumann and I knew there were interesting people who could be spotlighted, one only has to wander around downtown for 20 minutes before running into one of the million monuments or memorials in Indianapolis. To cap off our trip, Neumann and I hit up the lanes for a little duckpin bowling at Atomic Duckpin Bowl. What sets this sport apart from its non-aviary cousin is that the pins are shorter and wider and the ball is about the size of a softball. It’s actually similar to candlepin bowling (I’ve probably bowled in most types of lanes available in the states) in strategy and origin — both are from the East Coast, but I guess Indy has the farthest west alley. 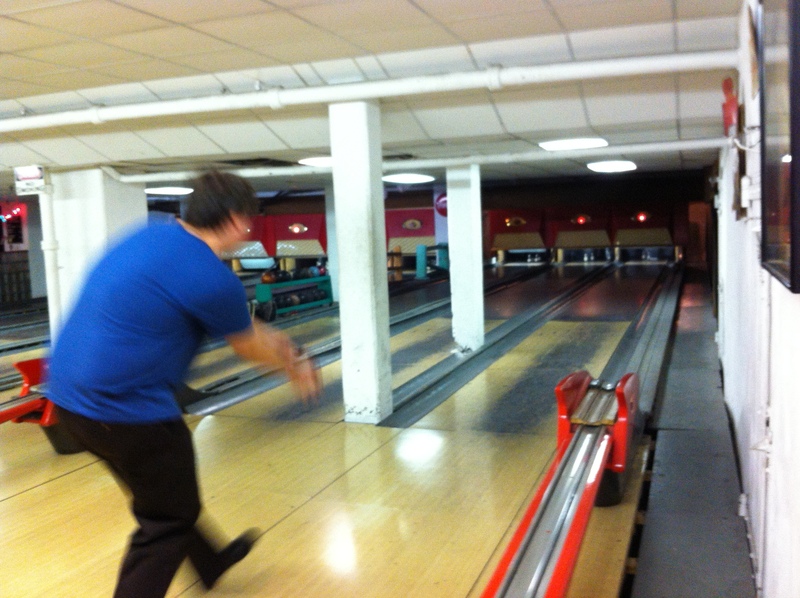 Neumann lines up a strike in duckpin bowling. Yes, he did end up winning. The biggest change in strategy in duckpin as compared to normal bowling is that, in normal bowling, I find that if you apply ample force and a somewhat-straight trajectory, you have a pretty good chance at striking. In duckpin, whipping the ball down the lane has a rather sniper-like effect — you’re more likely only to take out a specific pin instead of smashing them all. Duck pins also are all attached to strings, so they’re re-racked by the machine simply pulling the strings back up. Neumann and I had one persistent pin that was resurrected every throw, no matter how many times we knocked it over. All bowled out, we ate at the BBQ place upstairs for an adequate meal in more-than-adequate portions and called it a night. Neumann and I left Indy the next morning, completely satisfied with our two-day excursion. We weren’t sure we could stretch the fun another night, but for anyone looking to experience a pleasant diversion from Chicago or any other Midwestern city, Indianapolis should provide enough Hoosier thrills for a weekend getaway.